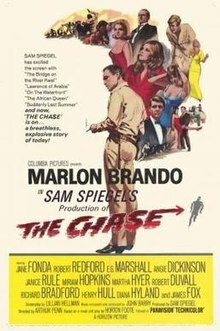 The Chase is a 1966 American Technicolor drama film in Panavision directed by Arthur Penn and starring Marlon Brando, Jane Fonda, and Robert Redford, about a series of events set into motion by a prison break. Because one of the two escapees is Charlie "Bubber" Reeves (Redford), wrongly assumed to be responsible for a murder, the escape causes a stir in a nearby town where Bubber is a well-known figure. The supporting cast features E. G. Marshall, Angie Dickinson, Janice Rule, Miriam Hopkins, Martha Hyer, and Robert Duvall. In a small town in Tarl County, Texas, where banker Val Rogers (E. G. Marshall) wields a great deal of influence, word comes that native son Bubber Reeves (Robert Redford) and another man have escaped from prison. Sheriff Calder (Marlon Brando), who continues to believe in Bubber's innocence, expects him to return to his hometown, where Bubber's lonely wife Anna (Jane Fonda) is now involved in a romantic affair with Bubber's best friend, Val Rogers' son Jake (James Fox). Bubber is left on his own after the second fugitive kills a stranger for his car and clothes. The townspeople, conflicted about his guilt or innocence, socialize and drink heavily while awaiting Bubber's return. They include the hostile Emily Stewart (Janice Rule), who openly expresses her lust for Damon Fuller (Richard Bradford) in front of her husband, Edwin (Robert Duvall). As the drinking and quarreling intensify, a group of vigilantes demand action from Calder. When he defies them, they beat Calder brutally before the sheriff's loyal wife Ruby (Angie Dickinson) is able to get to his side. Bubber sneaks into town, hiding in an auto junkyard. Anna and Jake willingly set out to help him, and the townspeople follow, turning the event into a drunken revelry and setting the junkyard on fire, causing an explosion which mortally wounds Jake. A bloodied and beaten Calder manages to get to Bubber first but, while he is leading him up the steps into the jail, one of the vigilantes, Archie (Steve Ihnat), shoots Bubber multiple times with a gun hidden in his coat pocket. Sick of the town and its people, Calder and Ruby leave town the next morning. The film deals with themes of racism (including scenes in which black men are harassed by white men), sexual revolution (many of the characters are openly engaged in affairs), small-town corruption (the sheriff is falsely assumed to be in the pocket of the man who helped appoint him), and vigilantism (in the form of townspeople who openly defy the sheriff in their search for Bubber). The movie is perhaps best known for a scene in which the sheriff played by Marlon Brando is brutally beaten by Richard Bradford, one of the three vigilantes; Brando would later cite this scene as an example of Method acting. Paul Williams thought this movie would be his big break but, after working on the film for three months, he was only shown on screen for a few moments and had "two lines" in the final film. Faye Dunaway auditioned for the film, but Jane Fonda was cast in the role of Anna Reeves. Following this, Arthur Penn tested Dunaway and cast her for his next film, Bonnie and Clyde. On release, the film gained generally positive reviews from critics, but Richard Schickel was dismissive in Life magazine. Pointing out its origins in the Horton Foote play, he wrote: "The Chase is no longer a modest failure ... it has been turned into a disaster of awesome proportions". Review aggregator Rotten Tomatoes reports that 80% of critics have given the film a positive review, with a rating average of 6.5/10. During an interview years after the film was released, Arthur Penn expressed his dissatisfaction with the film: "Everything in that film was a letdown, and I'm sure every director has gone through the same experience at least once. It's a shame because it could have been a great film." ^ Penn, Arthur, Michael Chaiken and Paul Cronin (2008). Arthur Penn: Interviews. Jackson: Univ. Press of Mississippi. p. 72. ISBN 1604731052. Retrieved 6 April 2015. Parish, James Robert (2006). Fiasco - A History of Hollywood’s Iconic Flops. Hoboken, New Jersey: John Wiley & Sons. pp. 359 pages. ISBN 978-0-471-69159-4. This page was last edited on 26 January 2019, at 21:28 (UTC).